TUKWILA, Wash. — Like most other American high school students, Garret Morgan had it drummed into him constantly: Go to college. Get a bachelor’s degree. So he tried it for a while. 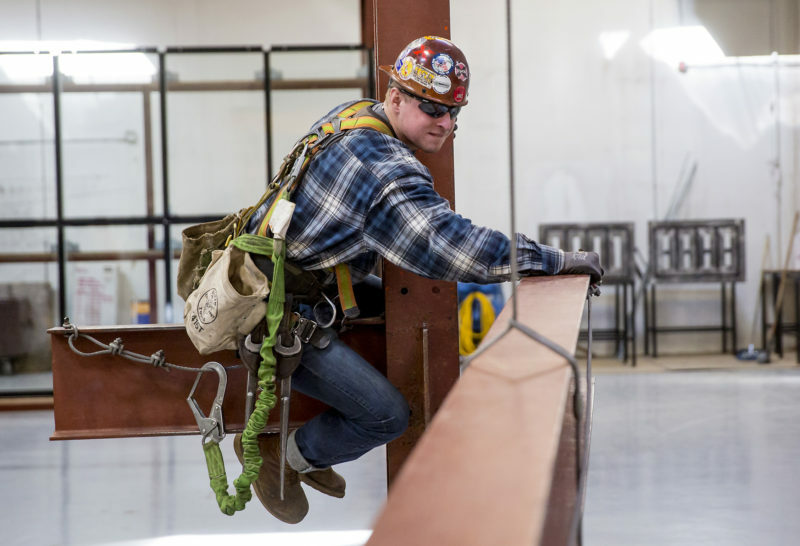 Then he quit and started training as an ironworker, which is what he’s doing on a weekday morning in a nondescript high-ceilinged building with a cement floor in an industrial park near the Seattle-Tacoma International Airport. Clipped to safety harnesses, Morgan and several other mostly young men and women in work boots, hardhats and Carhartt’s, and with heavy wrenches hanging from their belts, time each other wrestling 600-pound I-beams into place. Others are rigging pulleys to a scaffold or outside weaving rebar. Morgan, who is 20, is already working on a job site when he isn’t here at the Pacific Northwest Ironworkers shop. 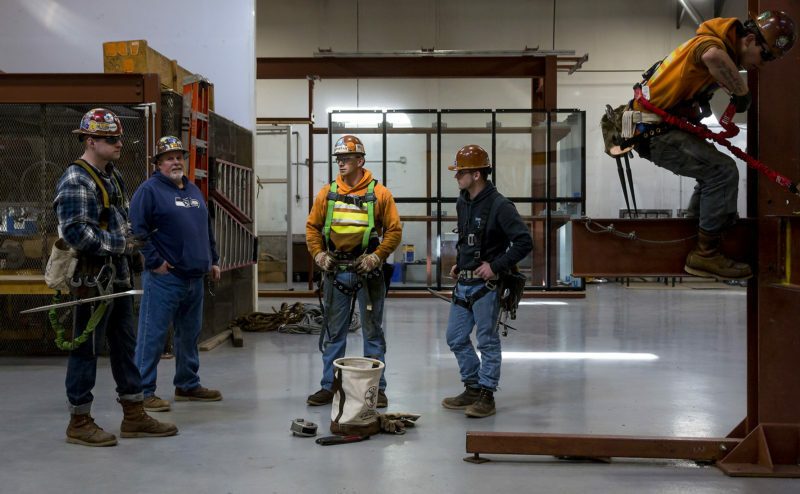 Seattle is a forest of construction cranes, and employers are clamoring for skilled ironworkers. He’ll finish with enough college credits to earn an associate degree after four and a half to five years. In the meantime, he gets benefits, including a pension, from employers at the job sites where he’s training. And he’s earning $28.36 an hour, or more than $50,000 a year, which is almost certain to steadily increase. In fact, while a shortage of workers is pushing wages higher in the skilled trades, the financial return from a bachelor’s degree is softening, even as the price — and the average debt into which it plunges students — keeps going up. Yet so effectively have high school graduates been encouraged to get one that high-paid jobs requiring shorter and less expensive training are going unfilled. This not only affects them, but has become a growing threat to the economy. Other people are seeing it, however, and raising alarms. 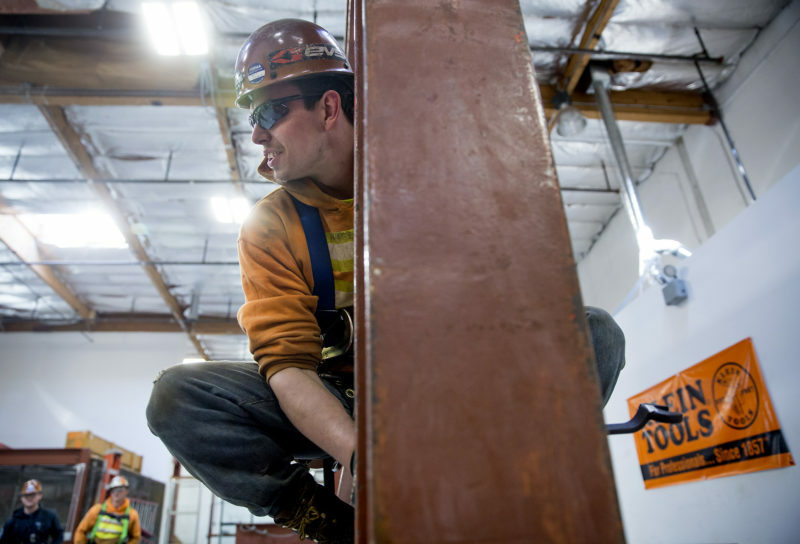 In a new report, the Washington State Auditor found that good jobs in the skilled trades are going begging because students are being universally steered to bachelor’s degrees. Among other things, the auditor recommended that career guidance — including about choices that require less than four years in college — start as early as the seventh grade. “There is an emphasis on the four-year university track” in high schools, said Chris Cortines, who co-authored the report. Yet, nationwide, three out of 10 high school grads who go to four-year public universities and more than one in five who go to four-year private colleges still haven’t earned degrees within even six years, according to the National Student Clearinghouse, which tracks this. And not just in Washington State. Seventy-percent of construction companies nationwide are having trouble finding qualified workers, according to the Associated General Contractors of America; in Washington, the proportion is 80 percent. There are already at least 3,259 more jobs than Washingtonians to fill them in such skilled trades as carpentry, electrical, plumbing, sheet-metal work and pipe-fitting, the state auditor reports. Many pay more than the Washington average annual wage of $54,000. Of 260,000 “career jobs” expected to become available here over the next five years, according to the Washington Roundtable, an association of employers, one-third will not require bachelor’s degrees. 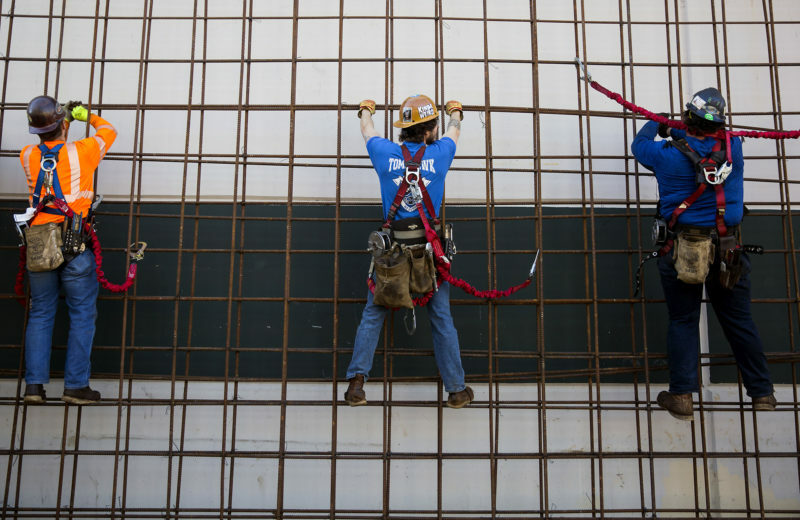 The number of workers needed in the construction trades nationally is expected to rise 11 percent through 2026, far faster than other occupations, or by 747,600 new jobs, the Bureau of Labor Statistics says. Construction, along with health care and personal care, will account for one-third of all new jobs through 2022, the agency says. It also predicts that, between now and 2022, there will be a need for 138,200 new plumbers. While 7,000 people become electricians every year, about 9,000 retire, according to the National Electrical Contractors Association; by 2021, the nation will have to turn out 17,557 new electricians annually. And as politicians debate a massive overhaul of the nation’s roads, bridges and airports, the U.S. Department of Education reportsthat there will be 68 percent more job openings in infrastructure-related fields in the next five years than there are people training to fill them. Yet the march to bachelor’s degrees continues. The number of bachelor’s degrees conferred has more than doubled in the last five decades, from 839,730 in 1970 to nearly 1.9 million in 2014-15, the last period for which the figures are available, the U.S. Department of Education reports. And while people who get them still are more likely to be employed and make more money than those who don’t, that premium appears to be softening; their median earnings were lower in 2015, when adjusted for inflation, than in 2010, the department says. Meanwhile, the number of students who borrow to pay for college has increased from half in 1989 to nearly 70 percent now, and their average debt has grown from $15,200 to $26,300. But it wasn’t for him, and now he’s studying automotive repair at Lake Washington Institute of Technology, where he’s reassembling a transmission in a corner of the auto shop while a classmate checks the specifications on a computer monitor. Dickinson already has a part-time job at a dealership that specializes in expensive cars, and no worries about finding a full-time one when he’s finished. The placement rate in his program is 94 percent and median pay in the industry is just under $40,000 a year, according to the Bureau of Labor Statistics; in the Seattle area, some automotive technicians make as much as $75,187, the salary research company PayScale reports. Meanwhile, one of his roommates who goes to the University of Washington is racking up thousands of dollars in debt, said Dickinson, who is 21 and wearing safety goggles and a “COLLEGE” sweatshirt inspired by the movie Animal House. Young people don’t seem to be getting that message. The proportion of high school students who earned three or more credits in occupational education — typically an indication that they’re interested in careers in the skilled trades — has fallen from one in four in 1990 to one in five now, according to the U.S. Department of Education. “There are more jobs, more opportunities in these kinds of fields, and they’re requiring more skills, yet we have the same finite number of students,” Kreamer said. Washington is not the only state devoting attention to this. California is spending $200 million to improve the delivery of career and technical education. 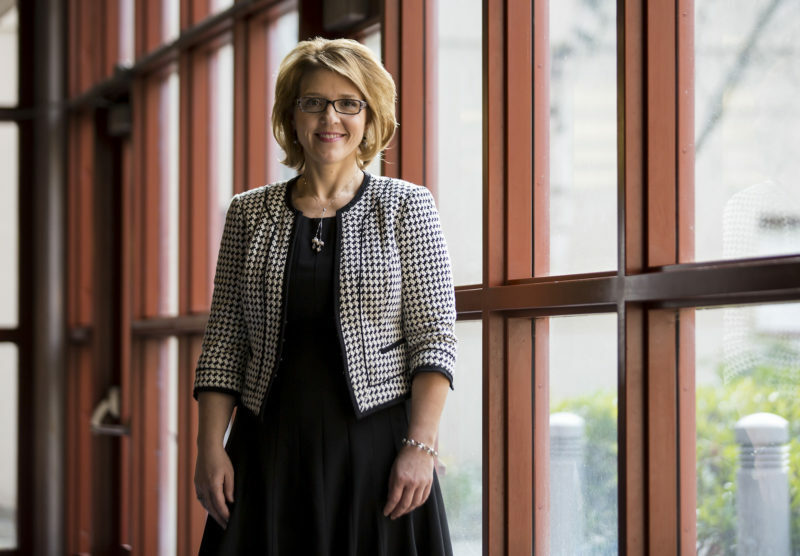 Iowa community colleges and businesses are collaborating to increase the number of “work-related learning opportunities,” including apprenticeships, job-shadowing and internships. Tennessee has made its technical colleges free. So severe are looming shortages of workers in the skilled trades in Michigan, Gov. Rick Snyder in February announced a $100 million proposal he likens to the Marshall Plan that rebuilt Europe after World War II. Using scholarships and stipends, among other things, it would prepare more people for the 811,000 expected job openings through 2024 in industries facing worker shortages, which Michigan officials say don’t require bachelor’s degrees and pay an average of $60,000 a year. At the federal level, there’s bipartisan support for making Pell grants available for short-term job-training courses and not just university tuition. The Trump administration supports the idea. Congress should “invest in workforce development and job training [and] open great vocational schools,” President Donald Trump said in his State of the Union address. For all the promises to improve vocational education, however, a principal federal source of money for it, called Tech-Prep, hasn’t been funded since 2011, when it went from $103 million a year to zero; Trump’s budget proposal sought to cut the remaining state grants for career and technical education by another $166 million, though Congress instead approved a $75 million increase. A quarter of states last year reduced their own funding for postsecondary career and technical education, according to the National Association of State Directors of Career Technical Education. But money isn’t the only issue, advocates for career and technical education say. An even bigger challenge is convincing parents that it leads to good jobs. “They remember ‘voc-ed’ from what they were in high school, which is not necessarily what they aspire to for their own kids,” Kreamer said. These perceptions fuel the worry that, if students are urged as early as the seventh grade to consider the trades, low-income, first-generation and ethnic and racial minority high school students will be channeled into blue-collar jobs while wealthier and white classmates are pushed by their parents to get bachelor’s degrees. Already, 82 percent of parents with bachelor’s degrees, and 86 percent who have advanced degrees, expect their kids to get bachelor’s degrees, compared to 60 percent of parents who never finished college, according to the U.S. Department of Education. So do 72 percent of suburban parents, versus 63 percent who live in towns and 68 percent in rural areas. In a quest for prestige and rankings, and to bolster real-estate values, high schools also like to emphasize the number of their graduates who go on to four-year colleges and universities. “We’re always awarding great big banners of excellence to schools that send a lot of kids to college,” said Gene Wachtel, director of career and technical education for the Lake Stevens School District in Washington. His classmate, Hunter Vance, has a cousin who’s a plumber. “He gets a lot of money for that,” Vance said. “I do want to learn a trade where I can use my hands.” But his parents, he said, “are definitely pressuring me” to go to college. Angela Riebli, head of counseling at Lake Stevens High, remembers a student with a 3.7 grade-point average who “just really wanted to be an auto mechanic. It took a little bit of work, conversations with the parents to help them understand that this is your son and this is your son’s life,” said Riebli, whose office walls are hung with thank-you notes from students. Most high school college counselors don’t have that kind of time to talk about career options; the average public school counselor in the United States is responsible for 483 students, according to the American School Counselor Association and the National Association for College Admission Counseling, nearly twice the caseload the school counselors’ association recommends. In California, it’s one counselor to 760 students; in Washington State, one to 482. Jessica Bruce went to college after high school for one main reason: because she was recruited to play fast-pitch softball. “I was still trying to figure out what I wanted to do with my life,” she said. Now she’s an apprentice ironworker, making $32.42 an hour, or more than $60,000 a year, while continuing her training. At 5-foot-2, “I can run with the big boys,” she said, laughing. This story was produced by The Hechinger Report, a nonprofit, independent news organization focused on inequality and innovation in education. 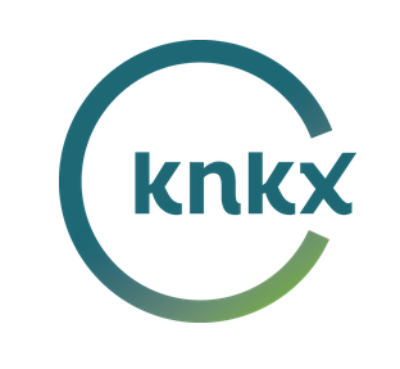 KNKX reporter Ashley Gross contributed to the reporting. Sign up here for our higher-education newsletter.